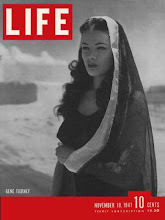 Gene Tierney Movie Page: One of Gene Tierney's best known movies: Leave Her To Heaven(1945). 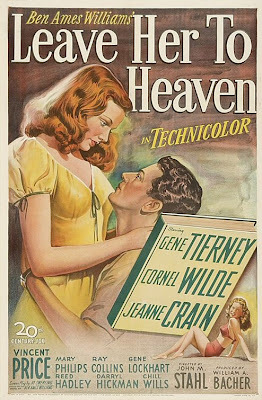 One of Gene Tierney's best known movies: Leave Her To Heaven(1945). 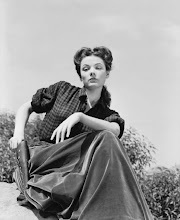 Gene Tierney, is best remembered for her performance in the title role of Laura (1944) and her Academy Award nominated performance for Best Actress in Leave Her to Heaven (1945). Film Noir. 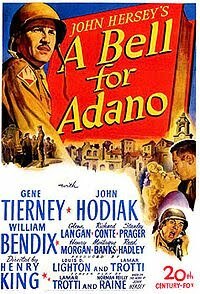 Cast: Gene Tierney, Cornel Wilde, Jeanne Crain, with Vincent Price, Darryl Hickman, and Chill Wills. 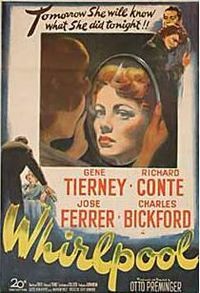 It was adapted for the screen by Jo Swerling, based on the best-selling novel by Ben Ames Williams, and was directed by John M. Stahl. 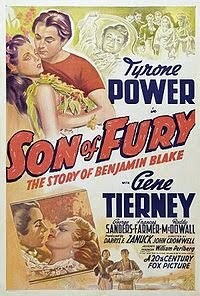 Tierney received an Oscar nomination as Best Actress in a Leading Role for this film. Richard is working on a new novel, when he accepts an invitation from Glen to visit him at his ranch in New Mexico. During the train ride, Richard meets a beautiful young woman who says that he reminds her of her late father. Later, Richard meets Glen at the station, who tells him that Ellen Berent, is also visiting his family with her mother Margaret and sister Ruth. During dinner, Ellen tells Richard that they have come to scatter her father's ashes at his favorite spot in the mountains. Richard follows close behind as the family scatters the ashes. The following day, as Richard is working on his novel on the patio he confesses to Ellen that he asked Glen about her fiancee, attorney Russell Quinton, she admits that she has taken off her engagement ring. 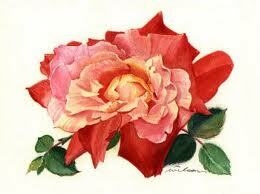 The next night, Russell comes in with the storm, having received a telegram from Ellen breaking off their engagement. Richard is surprised when Ellen announces their engagement and the couple are soon married. While on their honeymoon, the newlyweds travel to Warm Springs, Georgia, to visit Richard's brother Danny who is recovering from polio. Ellen helps Danny to walk with crutches, and soon the boy is joining Ellen and Richard at, Back of the Moon. Ellen is not happy with the presence of Danny and old family friend, who is also the care taker of the lodge. Ellen is beside herself with anger when Margaret and Ruth show up at the lodge. Richard is embarrassed by his wife's actions. 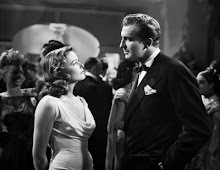 Ellen accuses Richard of being in love with Ruth, then begs for his forgiveness by telling him that she does not want to share him with anyone else. Margaret and Ruth leave soon after, and one afternoon, Ellen takes Danny on his daily swim in the lake. Ellen follows in a small boat behind Danny, but when a cramp over comes him he begs her to help him, she watches without feelings as he drowns. Over time, Richard realizes that his wife's insane jealousy is the the cause of all the tragedies in his life. But... nobody, can guess what she has planned for the rest them. Tierney's performance is very chilling. 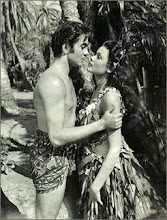 Tierney said "Leave Her to Heaven" was "the best role she ever had and it was also her favorite film." Some of the beautiful ranch scenes were filmed in Sedona, Arizona. 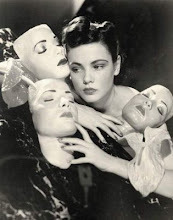 Gene Tierney is one of my favorite actresses. 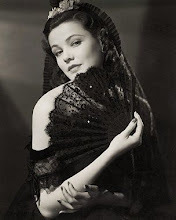 Please check out my Gene Tierney page for movie reviews and pictures. Located on the side bar. 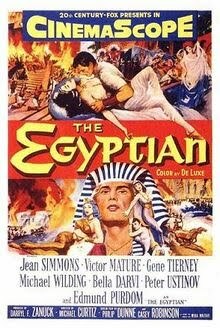 Fun fact: This is a film-noir in Technicolor. I saw the movie last night; the colors were astounding. Gene plays the role impeccably, she even manages to gain some sympathy and provide an explanation why she is doing her evil deeds. For instance when she is just married, and she tells her husband she wants to be alone with him for a few days for the first time (“the walls are as thin as paper and the acoustics disgustingly perfect”), he invites her family to visit. The scene on the lake, were she puts on her sunglasses and let the young crippled boy drown, is atrocious. Fun fact 2: The title is taken from a line from Shakespeare's Hamlet. Rob, Thank you for the interesting fun facts.